1963 Rambler Classic was completely restyled, it was crisp, clean and very, very modern. It and the Ambassador were received Motor Trans Magazine's Car of the year award. 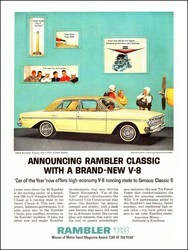 The net result was solid sales, with 320,019 Rambler Classics sold.